Delano Sam-Yorke is the latest player to leave the Gallagher. 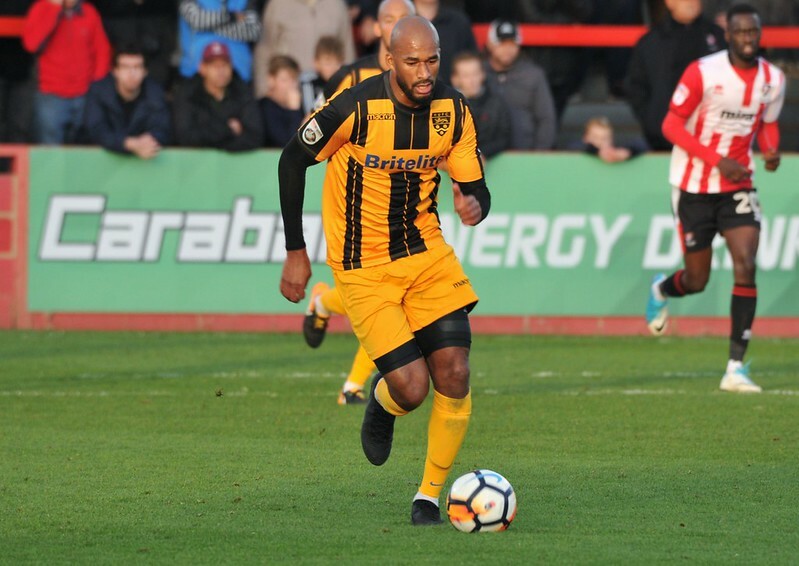 Following on from the departures of Joe Anderson and Reece Prestedge earlier today, the striker has been released by Jay Saunders as he sets about building a squad for the club’s third season in the Vanarama National League. Sam-Yorke joined the Stones on a two-month loan from Woking in January 2017 and his performances during that time made him the club’s first signing of last summer. This season has seen him make more than 40 league and cup appearances. Jay said: “I think D would be the first to admit that this has been a difficult season for him. “He’s one of those lads who gives you 110% and I know he’s been frustrated that the workrate hasn’t been matched by goals. “For me, the highlights of his time here would be that loan spell last season where he made such an impact and games like Cheltenham this season where, despite getting sent off, he was outstanding, scoring those two goals and running their defence ragged.